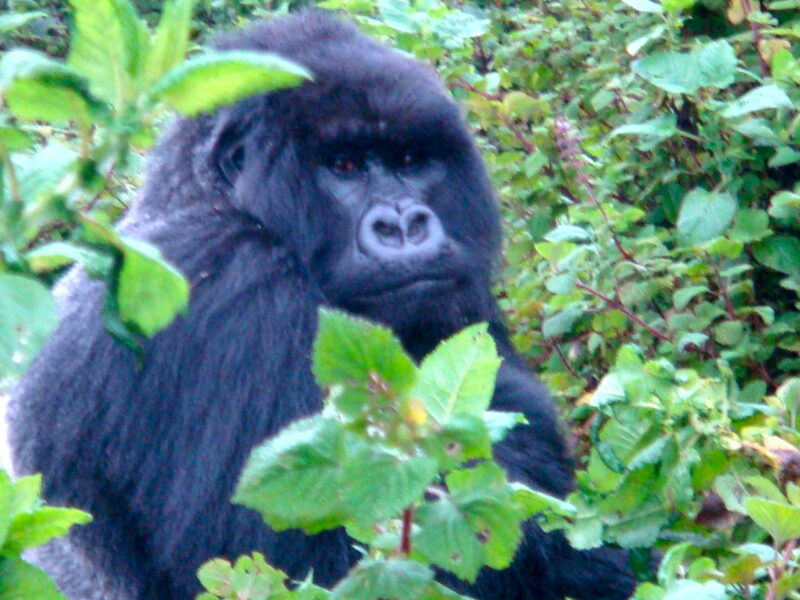 Gorilla trekking in Rwanda was my first true bucket list item before I even knew what a bucket list was. The childhood wish dates back to 1988 when I first saw Gorillas in the Mist and Sigourney Weaver’s portrayal of Dian Fossey, a scientist who travels to Rawanda and Uganda to study the declining population of mountain gorillas. A lot has changed since the 1980s. Since 2005, preservation efforts for the critically endangered species are high and rehabilitated former poachers serve as guides for the treks, they did on my trek at least. Don’t quote me on these numbers but I’ve read there are less than 800 mountain gorillas remaining in this world and can only be found in 4 national parks in 3 countries (Uganda, Rwanda and Democratic Republic of Congo). Their fate is largely based on political stability as tourist revenues keep conservation afloat. At the moment, the surrounding region is not that stable. It is best to track mountain gorillas either in Rwanda Volcanoes National Park or Uganda’s Bwindi Impenetrable National Park due to instability in certain parts of the Congo. I chose Volcanoes National Park for gorilla trekking in Rwanda as the trek could be done as a one day excursion vs three days needed for Bwindi. 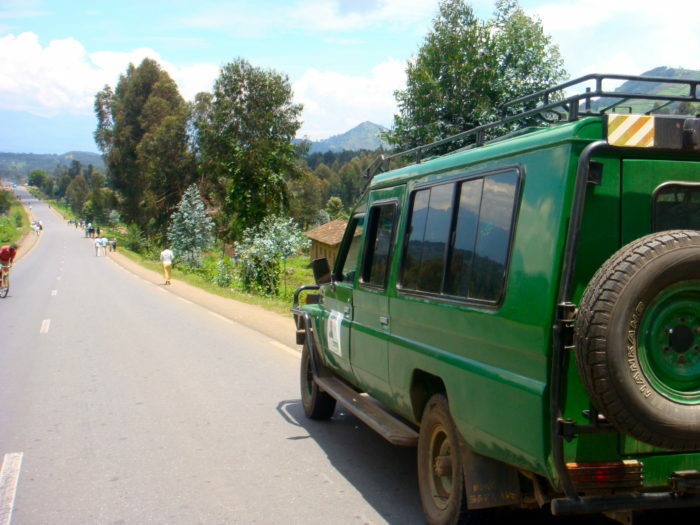 Gorilla trekking in Rwanda requires a bit of planning, mainly due to the gorilla permit. Visitor access is strictly controlled and only 80 permits are issued per day. Makes a lot of sense if you think about it… the gorillas wouldn’t take too well to hundreds of people running around their territory clicking selfies every few seconds. Imagine. Total mayhem. Peak season (drier months) runs June through September and December through March. Securing a permit does take advanced notice given the high tourist count and limited number of permits. I went in October. You must get the permit well in advance of your trip as your itinerary will depend on the date for which its issued. Get it either through your travel agency/tour operator or Rwanda Development Board. I used Magic Safaris for everything in Rwanda. They organized by whole itinerary from Kigali to Lake Kivu (except for Nyungwe Forest which was a side excursion, you can read about it here). Magic Safaris were professional, highly responsive by email even after my itinerary went through 30 iterations. Their jeeps were secure, clean and comfortable and had experienced and courteous drivers. Everything was smooth sailing. A word of caution, permits are not cheap. But it’s one of those experiences where you repeatedly justify the price in your head. “It’s a once in a lifetime thing, it’s a once in a lifetime thing.” I’m going gorilla trekking in Rwanda, repeat gorilla trekking in Rwanda! 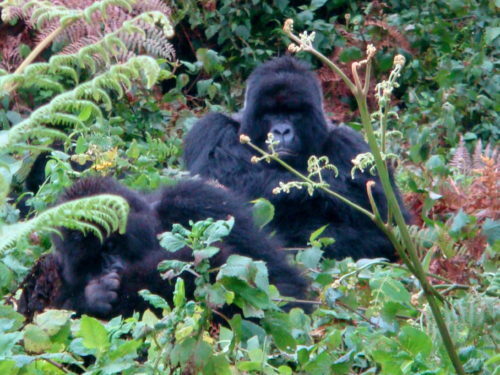 Permits for Rwanda’s Volcanoes National Park cost $750 per person for one hour with the gorillas. The permit cost for Uganda is less and they also run promotions in off season for as low as $350. 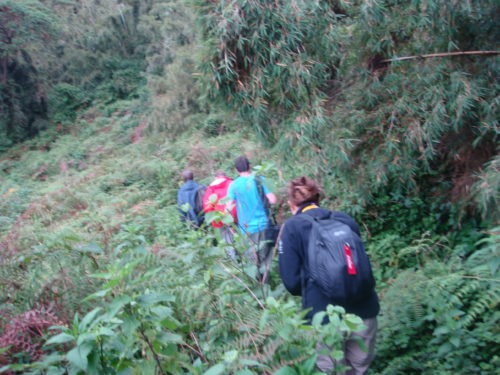 Each park offers a different experience and the mountain gorillas are said to be different to one another. 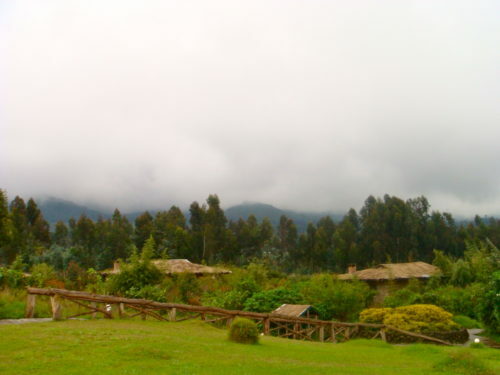 Volcanoes National Park is located in the small village of Musanze, previously known as Ruhengeri. 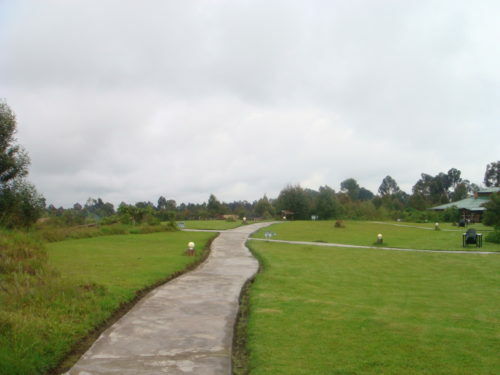 The drive is 2 hrs from the capital, Kigali, so its very accessible. The park is situated in northwestern Rwanda and borders Virunga National Park in the Congo and Mgahinga Gorilla National Park in Uganda. 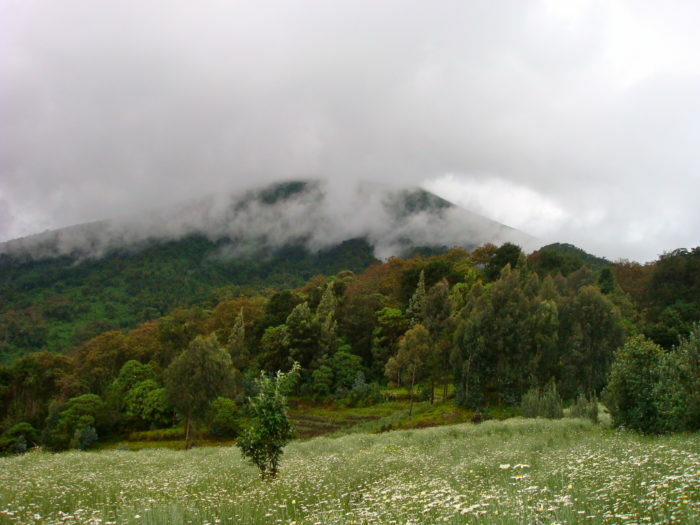 About 5 volcanoes are located in the park and trekking excursions to the volcano peaks are popular. The movie I referred to at the beginning had an apt title as the volcano peaks were always covered in a heavy layer of fog. 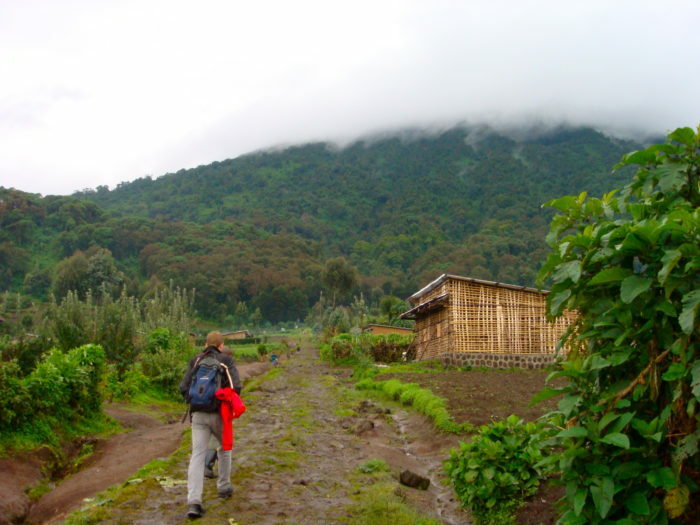 There are a handful of lodges to choose from when gorilla trekking in Rwanda. 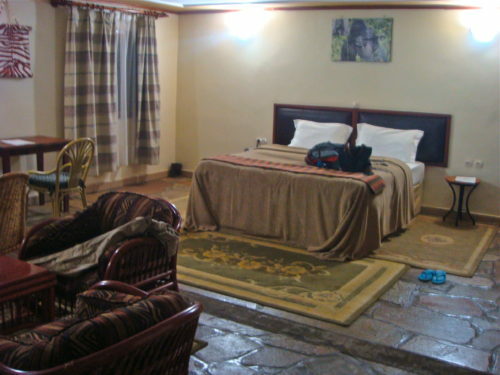 I chose Mountain Gorilla View Lodge for its location, view of Virunga Mountains and comfort level. The cost was completely acceptable. Two other lodges did peak my interest, Virunga Lodge and Sabyinyo Silverback Lodge but the price differential compared to Mountain Gorilla View Lodge was a few hundred dollars per night and it didn’t seem justified based on the pics I was seeing online. 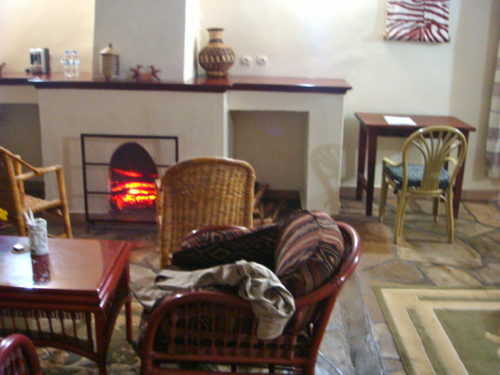 When I arrived, I was delighted at how private and huge my chalet was, with its own fireplace and sitting area. The lodge is serene and has a complimentary shoe cleaning service which is much needed after your trek. I thought my shoes were garbage worthy after sliding down mud ridden hills in the park but the skilled hotel employee brought them right back to life. The one negative about the lodge was the food, it could use some improvement. Yup, its a painful 6am start on this day. You need to reach the park entrance by 7am. Bring a jacket and definitely wear trousers and long socks that you can tuck the trousers into… else your feet and not just your shoes will be covered in mud. 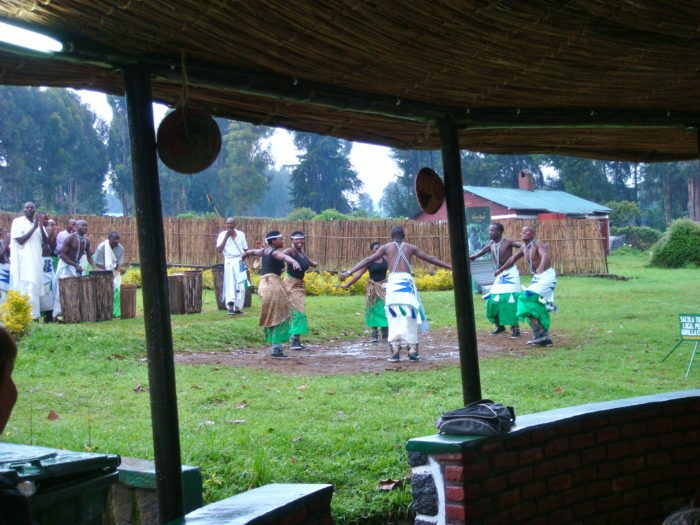 You’re kept entertained with a native Rwandan traditional dance in the morning and then see, if not meet, the other 79 trekkers during this time. Eventually everyone will be divided into groups of 8 to visit the one of ten mountain gorilla families habituated within. A short drive later with the rest of your group and you’re ready to head out. The trek can take anywhere from 30 minutes to a few hours, all depends on where your designated gorilla group has wandered. The group’s trackers are in constant touch with your guides via walkie talkie. 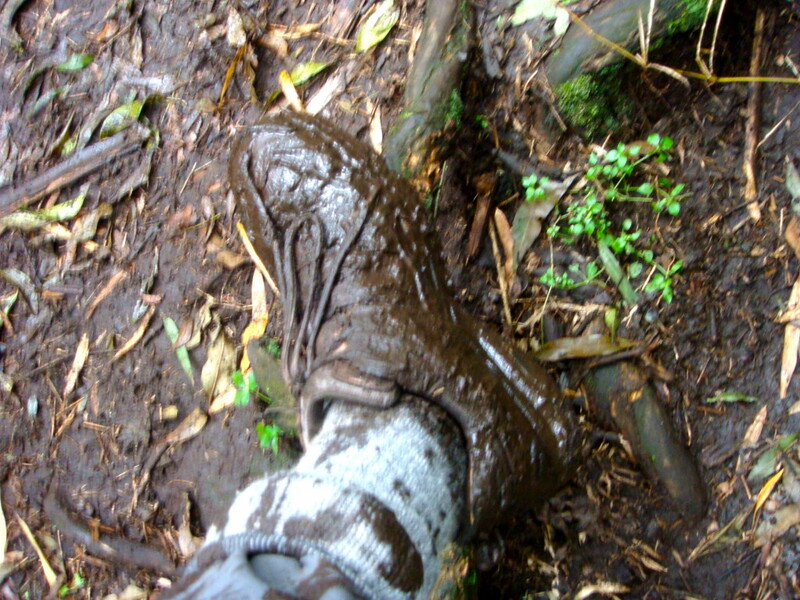 We trekked upward for about two hours in very muddy territory and cut through dense bush with machetes. Finally, the guides spotted two gorillas within the group. Everyone stops and holds their breath. Heart pumping, we remember the instruction given to us earlier at orientation: Don’t make direct eye contact with the gorillas, No sudden hand movements, No pointing and Absolutely no drinking or eating (duh! to that last rule). Next we spotted the silverback, our family had two. We spent the next hour in complete amazement, literally just a few feet away from the gorillas. Trackers with loaded rifles stay close by just in case. I don’t know which stirred more emotion, the indifferent to our presence mountain gorillas or the fact that I was blessed enough to witness this. 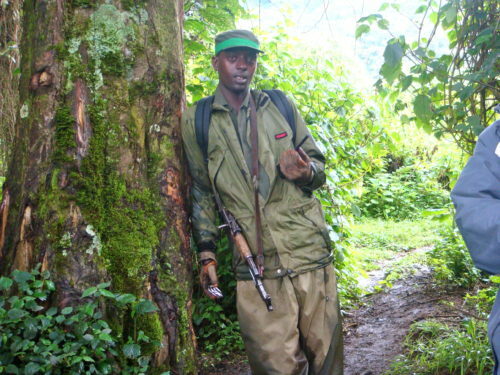 Mountain gorillas and the park rangers who track and protect them are not free from the threat of poachers. Baby mountain gorillas are worth tens of thousands of dollars in the illegal marketplace. Law enforcement is not always in sync with park authorities. 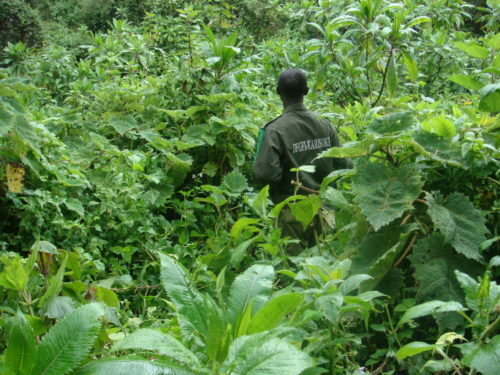 You can read here about one instance in 2011 where a poacher was fined only $37 usd after killing a mountain gorilla due to lack of evidence or here where poachers brutally murdered a park ranger in Cameroon after he discovered the bodies of two lowland gorillas in their camp. It’s really sad stuff. I can’t articulate just how sad these stories make me. With gorilla DNA matching human DNA at 98%, what do you think the punishment for killing these intelligent and majestic mammals should be? You can figure out what my answer would be. 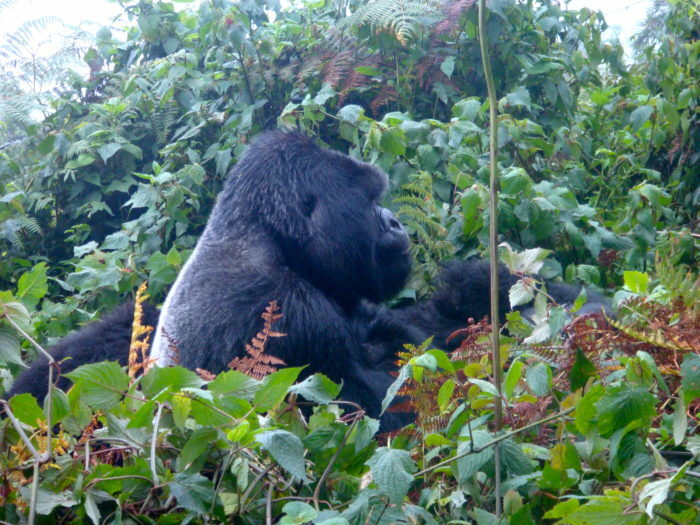 Like Gorilla Trekking in Rwanda? Pin It!